Summer is a great time to slow down and connect with your kids. Stop laughing, I'm serious! You can slow down! Whether it's a vacation or evenings at home, Summer is a great time to connect with your child through reading. My oldest daughter reads on her own now, so she rarely wants me to read aloud to her. In fact, when I try to read aloud to her, she quickly takes the book and starts reading aloud herself! Realizing how quickly she's growing up, this Summer may be the last one my other daughter (just a little younger) is young enough to need me for reading. I am determined to make the most of reading to my girls this Summer. Hopefully, they will learn how important reading is from watching me. If you read my list and think of something I missed, tell me in the comment section. When your kid sees you reading, he will understand reading is important and fun. The younger your child, the better this works. This doesn't mean you have to be seen walking around the house with an encyclopedia (remember those?). But, be sure you can be found reading the newspaper (remember those?) or a magazine on your iPad. The important thing is to model to your child the importantance of reading. 2. Read Aloud with Your Child. This probably won't work if you have older kids, but if you have young kids, be sure to red aloud to them. Reading together brings you and your child close and allows for a connection unlike any other. Reading usually opens opportunities for conversation as well. Simply asking questions like, “Why do you think he did that?” or “What else could she have said?” can create meaningful conversation between you and your child. For the older kid, try reading the same book as your teen and seek out ways to talk about the book together. 3. Make Books Easily Available. No brainer? Not really. Think about this: Are your child's books on the low self where he can reach them? Simply having books around the house with all kinds of topics may help your child get curious about a topic he wouldn't have otherwise considered. Be sure you have several topics of possible interest around the house, from space and flight to geology and geography. In general, the more pictures the better. Remeber, you're developing curiosity for reading, the books need not be all text! 4. Let Your Child Pick the Book. Ask your child what her favorite topic is; after discussing it, spend some time together shopping for the best book on that topic. You could search and buy online or simply visit your local library. The point here is to be simple and be together. This doesn't have to cost you anything other than time. And I'm pretty sure you won't regret the time spent! 5. Make Reading a Habit. Depending on your schedule, the best time to read may be morning, evening or at bed time. Whatever time you pick, try and create a routine over the Summer. If you're child is human, he will probably say, "I'm bored!" over the long Summer days. Try setting a daily time to read so you avoid telling your kids, "Oh, you're bored, read a book!" Let's work to not equate boredom with reading! Evening tends to work at my house. Mornings are busy and at night, well, my kids are wild at night. It's often difficult to get my girls settled down before bed enough to pay attention and read a book. However, Kids love routine, even if they hate it at first, trust me! 6. Connect Books to Life. Going camping or to the beach this Summer? Find a book that talks about camping or the ocean and read it a few days before traveling. I promise, the book will come alive to your kid. Then, while on the trip, you can refer back to the book to create more interest in reading and learning. Book Wink: for a list of books by subject, age and/or grade level. Read Write Think: parent resources related to reading by grade level. 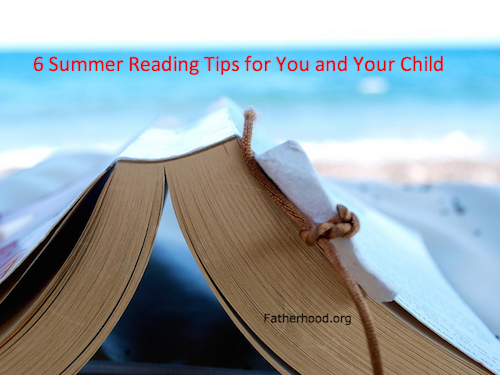 What are you and your child reading this Summer?